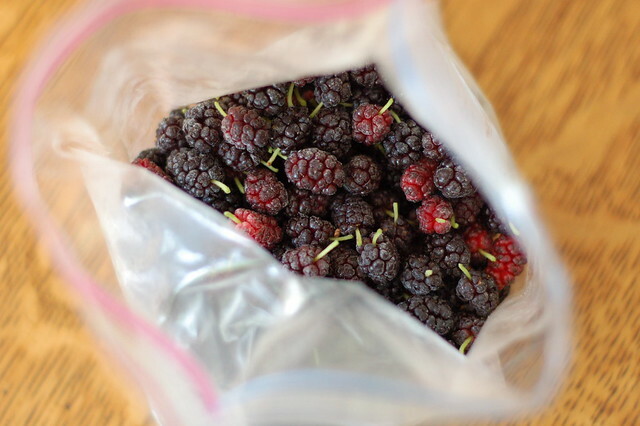 Mulberries have a mild, sweet flavor and are best eaten raw right off the tree during their short season. But you have to hurry because once the birds, squirrels and chipmunks figure out that they're ripe, it's all over. Some people put a sheet down on the ground (one you do not care about as it is going to get VERY stained) and then shake the tree - the ripe berries will fall right off the branches. The berries start out a whiteish green then progress from pink to red to black when ripe. There are also white mulberry trees but I've never met one so I can't tell you much about them. 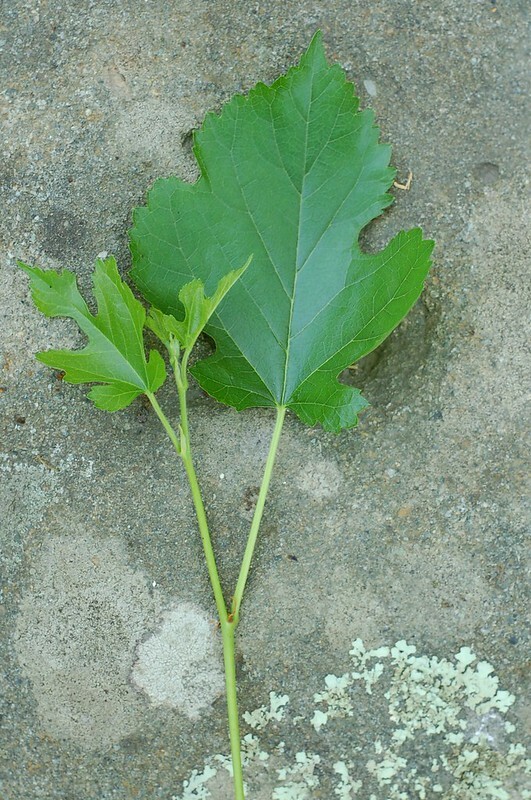 The leaves of the red mulberry tree that's native to the north east of the U.S. vary in shape -- some of them look rather like fig leaves and some are more or less just round. They're very pretty, regardless. The berries ripen remarkably quickly. For example, you might pick all the ripe ones off a given branch, go inside for a couple of hours and when you come back out again, there'll be a whole new crop of ripe berries on that same branch. Magic! In addition to eating them right off the tree, we've been freezing a bunch of them for later although our older son has been eating the frozen berries by the handful so I'm not sure how much "later" we'll get. 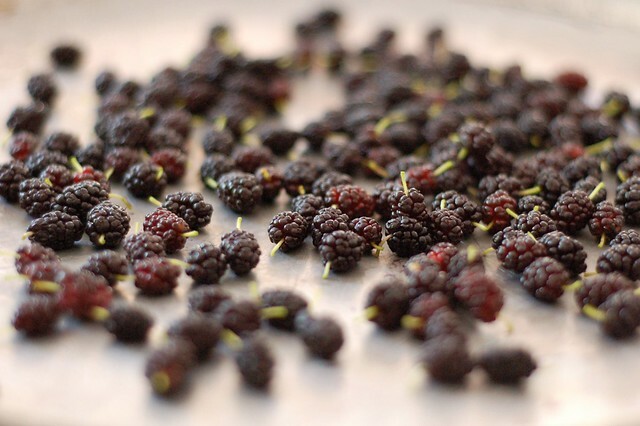 You can also make mulberry pie, crisp, ice cream, sorbet, smoothies and more. So get out there and start looking for the tree whose branches are a hotbed of avian activity. The tree could be anywhere from the size of a bush to 20 feet tall or so. 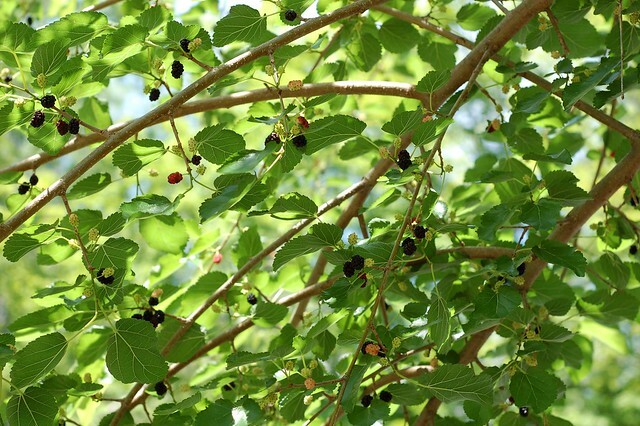 If you're not sure, check the ground - if it's covered with dark stains and smushed berries, it's probably a mulberry tree. For those of you in my neck of the woods - New York's Hudson Valley - there's a great mulberry tree on the dock at the end of the Saugerties Lighthouse trail that hangs down above the picnic tables. I was trying to figure out what type of berries they were on a tree down in Ulster Landing Park by the boat launch. 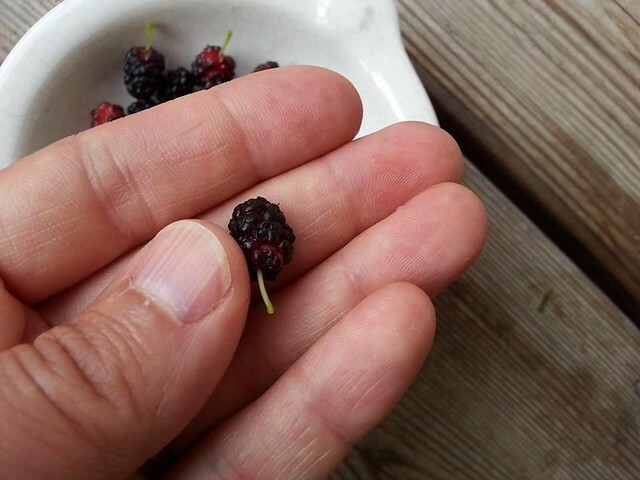 They looked and tasted similar to the mulberry tree at the Saugerties Lighthouse and the one at Slieghtsburgh park, but the berries at Ulster Landing are significantly smaller and look like the ones in your photo. I'm assuming they are all mulberry regardless of size. Definitely - there are a bunch of different cultivars. Our tree kind of defies description since we think that it's actually the rootstock part and that the weeping mulberry that was grafted on to it died (well, we can see that that part died). So I don't know what kind it is but I have noticed that many trees have much fatter berries.